For years now I have been preparing for being in a position to significantly extend the working life of Video Tape Recorders or to put it another way to be able to satisfy what I see as the inevitable requirement for Video tape playback facilities in the long term future. DONT PANIC! I am not so mad that I predict a comeback of VCRs similar to the relatively recent Vinyl Record comeback, but I am determined to make a significant difference to the availability of working decks at the present and in the future. I believe that this requires significant commitment not just financial in the worldwide search for what will inevitably be needed as listed below. VTR DECKS we are slowly heading towards 300 examples and as you can imagine storage is a challenge. SERVICE INFORMATION & TOOLS maintenance manuals (which were often never supplied in pdf form), extender cards, alignment tapes, good playback tapes which by necessity with use will deteriorate to poor playback tapes, new unused record tapes mainly to produce good playback tapes!, mechanical alignment jigs sometimes in the form of extremely expensive specialist Tool kits (example in photo) AND of course SPARES. Re-manufacturing of these parts will be the long term future but of course is expensive although some common failure items can (and will be able to be) created using 3-D printers. There are still some Video Head Drum reconditioning suppliers mainly in the USA now doing an excellent job and I am working with them closely. Currently they are supply significant numbers of U-Matic reconditioned drums worldwide! An example is that we have found that several examples of the Sony BVH-3000 series of 1 C-Format have a seized or partially seized drum which is caused by a casting made from what used to be called monkey metal changing shape so we are planning to get these made on a 3-D printer. 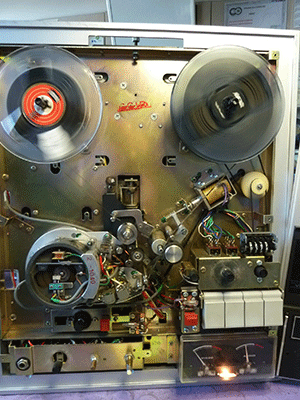 Although we have been working on VTRs for a long time now by far the bulk of our work has up until recently been on the recent current formats so there are significant mechanical (and electronic) challenges when something unfamiliar comes along e.g the Ampex DCT deck which I managed to obtain recently, described below. The initial challenge with our AMPEX Model DCT700d DCT Deck was to get this 70kg/0.5kW beast into the workshop and on the bench! After careful inspection and declaring it safe to switch on standing at a distance of course we had safe start up with significant unfamiliar mechanical noise which then stopped with an Air Pressure failure on the very dim display. We then serviced the display which improved significantly and set about replacing the several pipes for the compressed air guides which was definitely a new experience. You will see the air pipes and compressor in photos (DCT compressor & DCTdeck lifted3) with the tape transport lifted, a useful feature of this deck (photo DCTdeck lifted1,2&3). The work is still ongoing. As a footnote we have Oven (Incubator) Tape Baking facilities and plan to have these available for hire if there is a demand.